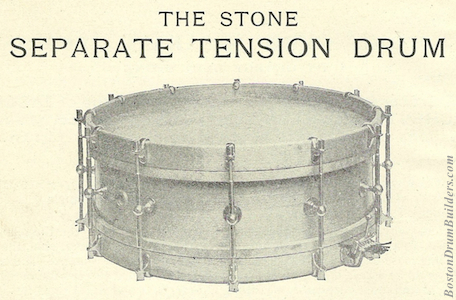 One hundred years ago, separate tension drums were still something of a new thing. Single tension drums were perhaps slow to fall out of vogue because they had more in common with the traditional rope tension instruments used by drummers for the past century or two. In the case of rope tension drums, the simple pull of a leather tug tightened both heads simultaneously. The same principle was true of early rod tensioned drums, the only difference being the use of metal rods and claws rather than rope and leather to tighten or loosen the heads. 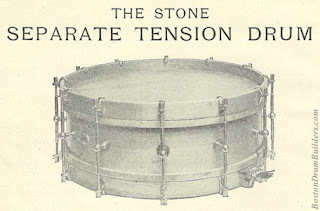 Catalogs of the 1910s often listed single tension drums and separate tension drums side by side making little suggestion as to which was preferable for any particular reason. A query posed to George Burt Stonein a 1915 magazine column then doesn't seem quite so uninformed. In response to a reader's question published in Volume 6, Number 1 of Jacobs' Orchestra Monthly, Stone chose to reprise his own article from the same publication in August of 1913. This topic was evidently so timely that he also reprinted the article in Geo. B. Stone & Son "Catalog H". The 1915 question and answer are transcribed here. Q. What is your opinion regarding single and duplex strain on drum heads? I notice that many of the late drum makers are straining with a single rod from rim to rim instead of each head separately. This is, of course, in keeping with the old principle of rope strain but I have had much better results from duplex strain because you can use a heavy batter and a thin snare head. A. In answer to your question, and to many other questions which I have received within the past month or so concerning the relative merits of separate and double tension, I will reprint below an article, entitled "A Word About Separate Tension." This article appeared in the August, 1913, issue of J. O. M. in the Drummer department. "There is at the present time considerable discussion among professional and amateur drummers as to the relative merits of separate and of double tension for tightening snare drum heads. "Personally, I think that separate tension is much the better for the following reasons: In a snare drum, the snare head should be comparatively thin, the tension being loose enough for it to vibrate freely against the snares. The batter head should be a certain degree thicker, for this head must receive the beating of the sticks and must necessarily be strong in order to stand it. The batter head should be considerably tighter than the snare head in order to properly transmit the concussion of the sticks to the snare head, also to properly rebound the sticks. "With ordinary rods (straining both heads at once), the snare head, being thinner and weaker, is strained much tighter than the batter head, which is the reverse of the correct adjustment. "In rainy weather or in a damp theatre pit where heads are bound to slacken, ordinary rods cannot begin to take all the looseness from the batter head without at the same time pulling the snare head to a high tension. 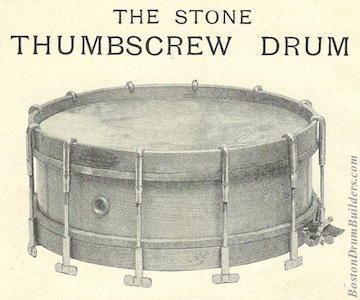 Result - a drum with a "tubby" tone that "plays hard" because the batter head is loose; so loose that it will not rebound the sticks to the player's satisfaction. "Another point, suppose one of the heads begins to pull down on one side (this is possible with the most even heads obtainable) an attempt to correct the unevenness by tension with ordinary rods invariably results in the other head being pulled out of shape, which makes retucking necessary. "Separate tension rods control each head independently. These rods allow the correct relative adjustment of the batter and snare heads, giving the user the exact combination of head tension that he has found in practice to be the most satisfactory for tone and playing qualities. In damp weather, provided he is using separate tension rods, Mr. Drummer will find it very easy to strain the batter head up to a sufficient tension to rebound the sticks without even touching the snare head unless he thinks it necessary. If one of the heads starts to pull down on one side more than on the other, it is a simple matter with separate tension rods, to adjust the strain so that one head will be evened out without disturbing the other. "And last, but not least, if while playing on a separate tension drum, his stick goes through the batter head, the player simply turns his instrument upside down, and finishes the engagement playing on the snare head. If he has had the forethought to buy an extra head, tucked, stretched and dried on a flesh hoop, it is a matter of but a few moments to put the drum into first-class playing condition once more."